List of all Sunday field trips and descriptions. Plogging is a concept that was started in Scandinavia after concern about the increase of plastic pollution and is making its way to the States. Plogging is a great workout that combines jogging while picking up litter. This field trip will be a 2 mile out and back led course to the beautiful Smoky Valley Lake spillway. This route is very technical and challenging. Recommended for advanced trail runners/hikers. All participants will receive a bag and are encouraged to bring as much debris back to the lodge with them. People that bring back the most debris will receive an award. This is a great field trip to learn how we can minimize our impact on the environment and get a great workout in at the same time. Participants will need running shoes and gloves. 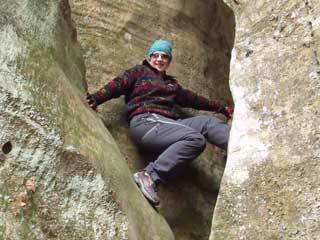 This hiking and caving trip will take you into the beautiful Tygart's Creek Gorge. This trip will consist of 1 1/2 hours of scenic hiking through rough terrain and steep inclines around Tygarts Creek. Along the way you will get to see two - three different wild caves. 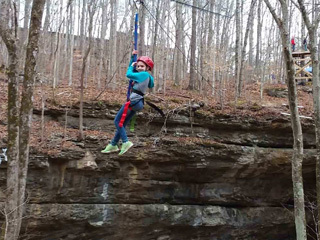 Skyscraper Cave is considered by many to be one of the most beautiful in Carter County. On this trip you will have to navigate through a very narrow canyon passage and a very tight S-turn side crawl for about 15-20ft. But the formation filled room at the end makes it well worth the crawl getting there. After Skyscraper Cave you will venture off to another cave or two found within the Tygarts Creek Gorge. 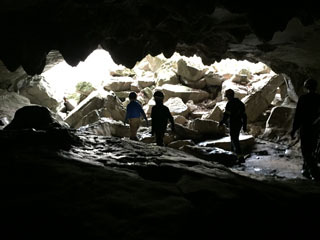 The caves are on private property and we have permission to visit the cave during Winter Adventure Weekend Only!